Attached private garage with free parking. Crystal chandeliers and beautiful mirrors surround our private rooms that accommodate 15 to 40 people. Please note: Mamma Melina does not accept reservations for Happy Hour. The Seattle Times, August 26th 2010: So thoroughly have the three Varchetta brothers re-imagined the relocated Mamma Melina their own mother would hardly recognize the place even though that's her name above the door. 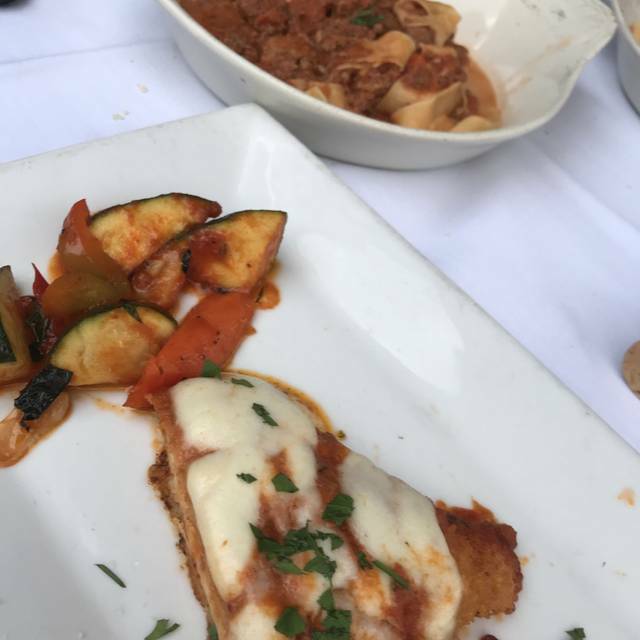 The new Mamma Melina, occupying the south end of the Corydon Apartments near University Village, has more in common with the Varchetta's stylish Barolo downtown. On a summer day you'd think it was Rodeo Drive and not the Burke-Gilman Trail that runs alongside the broad front patio. Amid shallow pools holding silver globes that glint in the sun, beautiful people in oversized sunglasses sip wine on thickly cushioned sofas or sup on house-made pasta under canvas umbrellas at white-clothed tables.Price points are moderate and the cooking is assured. This was our second time there. Our daughter is a freshman at UDub, and it was her discovery. We love it. Great food and atmosphere. Super friendly service. We will be frequent visitors! We have eaten there several times with family and the food has consistently been good as has the service. The only complaint we might have is that it can be pretty noisy when the tables are full. That is a deterrent to our going more often. Perfect spot for family weekend at UW! LOUD when it’s a full house! Food was good, service was excellent! Very nice! Just right for talking with friends. We wee allowed to stay late even until they were closing. Mamma Melina has been around for a long time and it's impressive that they are able to maintain such good and consistent quality after all these years. The food is fresh and well made. The ambience is warm and casual. Plus there is parking in the attached garage. Only area of improvement on this visit is our server who was young (looks like he's in high school!) and not as warm and engaging as the other servers we had in the past. An excellent dinner overall. Our book club meets here monthly. Great food and service. Good variety of thoughtfully selected and prepared menu items. Lunch menu changes from time to time with some standby items reliably available. Our wonderful waiter remembers us and doesn’t mind separate checks. The service is so great.....they know when to come to the table and when to wait. It’s wonderful to be able to have a conversation without yelling! The food is always excellent. Monday April 8th., Aaron greeted us as. Our party of 5 tried five different dishes. Amazing, each was wonderful and the Lamb Shank was the best I've had anywhere. What really made our evening great was our server, Tracy, she provided the finest service possible. I have over 20 years in fine dining management and that level of service is what we strive for, great job! We will return, often. 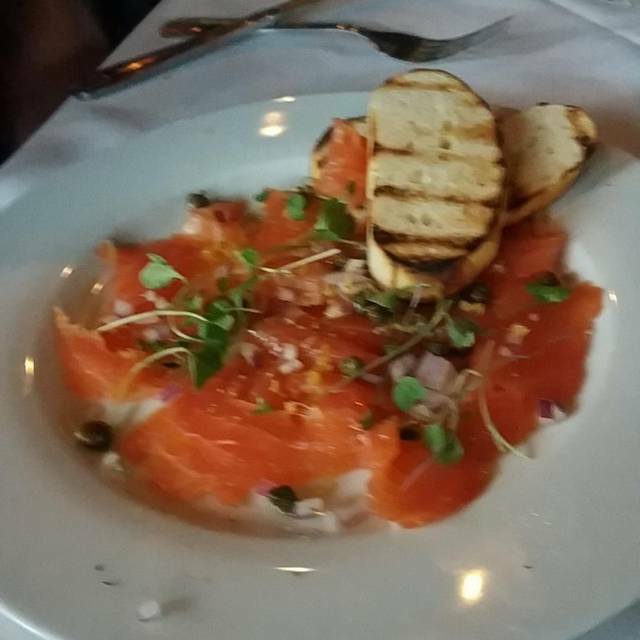 Food was tasty (I ordered the smoked salmon and crab linguine) and our server was excellent (recommended a perfect rose wine). Only sub-optimal experience was we weren't seated at our reservation time and had to wait with other walk-ins who were seated immediately after us. Not what I expect when using Open Table app. Host is not very inviting. He greets you with non smile /almost as if your interrupting him. We have visited several times if it were not for good food and service we would not continue to visit. He needs to be in the kitchen or else where not interacting with customers. Great food as usual! We just realized this time that there is a parking garage behind the restaurant. Our server was attentive and helpful but never rushed us as we enjoyed an excellent meal and wonderful conversation catching up with our daughter. This was our first experience at being disappointed. We were late to our reservation by 15 minutes and were told it would be a 10 min wait. Good so far. I told hostess my husband was handicapped, we came in the handicapped entrance and he wasn’t able to stand for 10 minutes so could we sit in one of the back tables while waiting. She said fine. Eventually a waiter showed up to show us to our seats. Then said if you want to sit here we could have served you right away. The hostess wasn’t thinking about accommodation at all. We didn’t mind waiting, we just needed to sit and could not walk to the front of the restaurant. Why didn’t she tell us the table we were waiting at was available for dinner and we didn’t really need to wait at all. Maybe she’ll understand as she ages or if she is crippled in an accident. In the meantime, she should not keep disabled people standing unnecessarily and listen more carefully to their physical needs. We did our own problem solving and survived. She just showed such little concern for our situation. Fortunately the waiter and our food were good. Great ambiance and excellent service. I've always only ordered the lasagna and it's consistent and delicious. Paired with a nice bottle of red wine and using the house bread to scoop up the remaining sauce... you are guaranteed to walk out completely satisfied. Will continue to go back for special occasions and "just because". Mama Melina is always a good choice especially with friends. It's a favorite of mine. Love the veal with mushrooms and several pasta dishes. If you are older and spent too much time in front of speakers when younger, try to get a booth. The noise level in a booth is fine. Happy hour is really a good deal--serving size is generous and wine prices fine. Very pleasant lunch with friends at Mamma Melina today(3/19/19). The manager was most welcoming and with excellent customer orientation. I’m particularly pleased as I almost wrote off this restaurant for my son and I were not treated well by a different manager at this restaurant last week. Today’s reservation was made a while back. I was too busy to find a different restaurant after the poor dining experiences last week but it all worked out well. Took my mom here to celebrate her 60th birthday and everything was fantastic! She had a blast enjoyed her food and even saved room for dessert lol. Will definitely be back soon! My favorite restaurant!!!! What more can I say. Love the food, the staff, the ambiance. I was disappointed with Mamma Melina this visit. 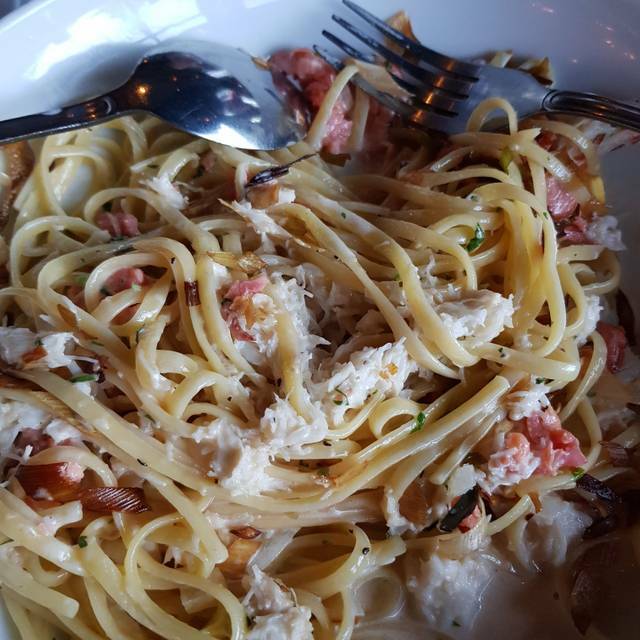 The food seemed hastily prepared and wasn't as tasty as it usually is--I ordered my usual, linguine with smoked salmon and crab. They also seated us at the back of the restaurant, even though the restaurant wasn't full when we arrived and we had a reservation (and we were all dressed appropriately!). Closer to the windows or in a booth would have been nicer. Our service was amazing! Thanks, Natalie. All 6 of us had a wonderful meal with a great wine recommendation from Natalie. It was a wonderful meal. We were there for 2 hours and we were only checked on one time. I was never offered another glass of wine. Service was bad. And the food is just so so for the price. I will not go back. Good food in a inviting atmosphere. Our service was great too. The food is alwaysconsistently good. The noise is always an issue. Mamma Melina never fails! In a room jam-packed with basket ball fans the service was terrific - and the noise calmed down once they'd left. I was really impressed with how the staff handled all the patrons! so tasty and perfectly seasoned. So - as always - great food, great service, great ambience. As always a delicious dinner but the noise level was horrendous. We went early on a Saturday evening hoping it would be not too noisy but the place was nearly full with lots of children and loud groups. The two of us had to yell at each other to be heard. Decibel level so high as to be uncomfortable. And then suddenly at 6:45 nearly half the people suddenly left. We heard there was a game at UW and think that's why. If you don't want to yell during dinner, I suggest you check beforehand what's going on or try to come at lunchtime. It was not a very pleasant experience and we left sooner than we had intended. 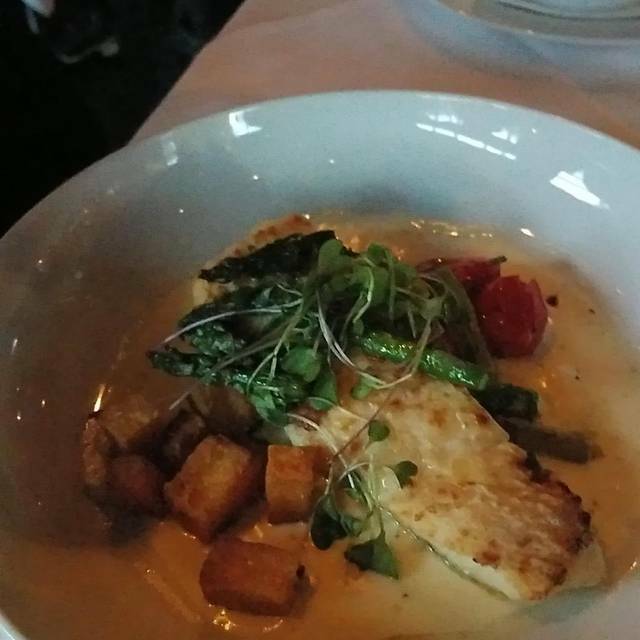 The food was delicious, the service really kind and attentive, and the place very pretty. The two-course prix-fixe menu was really good value. 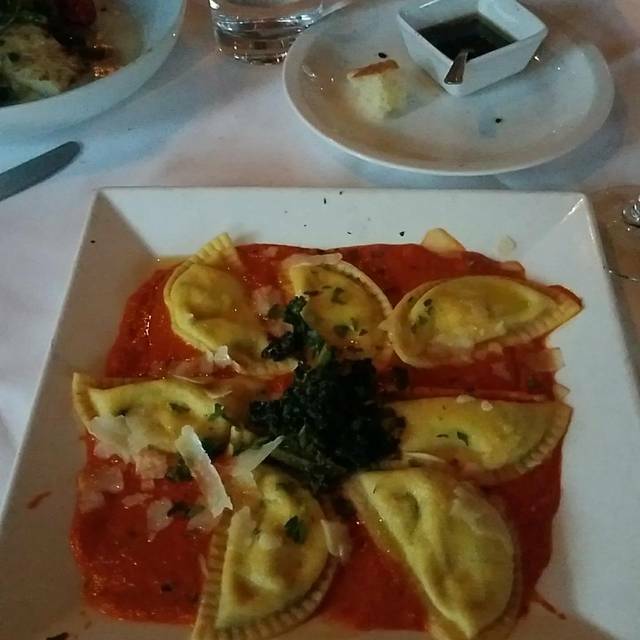 Many choices for each course, beautifully presented, and delicious flavors. The beet salad was a work of art when it came to the table. The spaghetti with shrimp was copious and extremely tasty. The ambiance was great, energy great and the food superb! We came from the University of Washington Women's Basketball Game and it was nice to meet up with some of the players! Recently was seated at a table that was so dark I could not read the menu without a flashlight (provided by waitstaff) and had difficulty seeing details of my food. Had a meal 2 weeks ago when Michael(server) added $50 additional incorrect charges and brushed it off so quickly without an apology. Was it a mistake or deliberate padding? Yes, he was super solicitous before the bill came. Wonderful back table for 6. Everything was very well done and food was delicious. 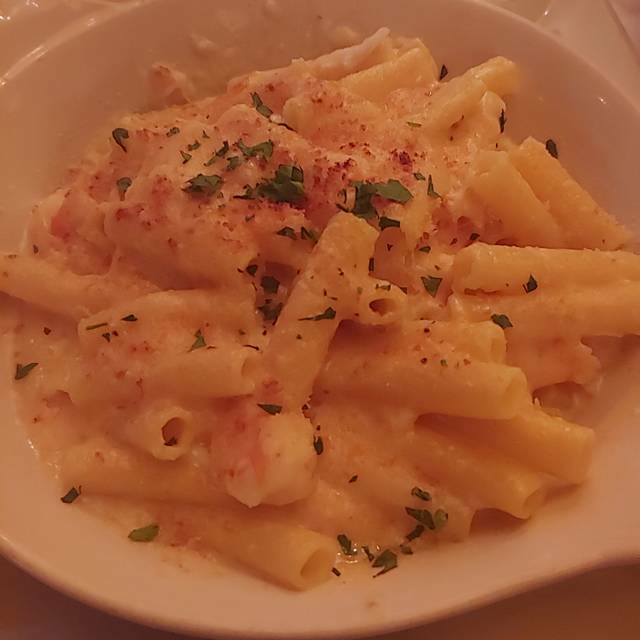 This place gets better and better if you like Italian food! Loved it enough to have dinner there twice in four nights. The seared tuna salad was the worst I've had anywhere. Not quite thawed perhaps? and fishy. I’m sorry but the food just isn’t any very good. I ordered the spaghetti with lobster. The lobster was great but the spaghetti and sauce weren’t very good. Clams were tough and salty. My husband ordered the lasagne; the nose was very strong with nutmeg as was the flavor; remainder of the flavor was very bland; we sent it back. the other diner had the smoked salmon linguine which she liked. The calamari appetizer was good. it’s great for locals and i’m told it has a good happy hour, if you like the food.